"You have to record the miracles," she said. I'm in the front seat and the first thing she asks is, "How did it go ...."
"The Lord answered every single prayer and then some." "Abby...that's amazing." Her face is beaming. "You HAVE to record the miracles." I take that statement and tuck it away with about a thousand other hints at my heart for writing. She's right. It's Monday. Work day who-knows-how-many of so many that we stopped keeping count a long time ago and we're carpooling, chatting away and I'm not sure if her weekend revelations on anxiety and exhaustion weren't intended more for me than her. Being 13 years older I should be the one imparting regular wisdom but that's rarely the case. In life we brush up against each other, hopefully refining each other. Those are the relationships worth keeping. The ones that show you you for better or worse while simultaneously showing you the Lord. That same Lord, the master of silver linings, makes good on everything. And as she carries on with talk of dreaming big and renouncing fear I'm smiling to myself at how with every twist and turn of her adventure of growing up in the city I am reminded of my own. And also of how I've allowed one of my favorite parts of myself to drift away unnoticed. The part that dreams. Big. It, this adventure, has been nothing short of 10,000 miracles. A daily miracle of redemption and healing fraught with plenty of growing pains as any good story of redemption should be. The Lord is thorough. A miracle of friendship, faith, and financial provision. Of professional accomplishment beyond wildest dreams. And those are just the surface obvious ones. What of the utter miracle of simple, complete forgiveness? Of soul freedom from reams of condemnation? Or the miracle flicker flame of joy that somehow refuses to be extinguished by torrential rain or circumstance? In the past year alone they seem to have been bunched together thick, the miracles. Or maybe it's just that the Lord has mercifully granted the ability to perceive them. So many miracles. And you, Rach, are one of my favorites. An answer to prayer if there ever was one and your story, our story too, is gold. Happiest Birthday to you today. This is the best gift I could think to give. You are loved and rejoiced over. What is this life we have and this sweet season we are in? This laugh out loud adventurous life steeped in food and courage. The Lord. Is. Grace. And you are quick to remind me that He is faithful to establish the work of our hands before us. Yours is a faith that begets wisdom far beyond your 23 years and it's that wisdom that grasps the urgency of recording the miracles. The loud ones and the quiet ones too. All of them. Because all is miraculous grace. And thanks to your faith, the next time the sky is falling and the hope of a miracle seems hopeless (because this is life and we are, after all, human) we'll look on all the miracles of the Lord recorded, offer up hearts of praise instead, and remember that He's forever working new ones. It's taken time to find my way back here. Writing's less like riding a bike and more like training for a marathon: the reward comes from dedication to the long term. There will be posts regrettable in word and form. There already are. And it takes all of me to not edit and delete which is the opposite of recording. But here we are. Getting words down, recording the miracles. I have a new food styling workshop coming up in September. And another in January. That's a miracle. The fact that this recipe is finally out in the world is also a miracle. Written almost a year ago the surrounding text has changed a half a dozen times and landed right back in the middle of the summer peach season. Even the littlest things work out exactly as they're meant to. If you only ever make one thing that I post for the rest of time, let it be these. Take liberty with whatever you tuck into the tops. Sliced pears or lightly caramelized apples would be lovely too. In the bowl of a food processor pulse the pecans until finely ground. Add the powdered sugar, buckwheat flour, and salt and pulse to combine. Melt the butter in a medium saucepan over medium heat, swirling on occasion until browned and fragrant. Set aside to cool slightly. Whisk the egg whites in a large bowl until frothy. Pour in the flour mixture and stir to combine. Add the brown butter and whisk until incorporated. Cover and chill until firm, at least 2 hours or overnight. To make the streusel combine the flour, sugar, and salt in the same food processor bowl (no need to wash.) Add the butter and pulse 5-6 times. Add the pecans and pulse until mixture comes together in clumps. Cover and refrigerate until ready to bake. Preheat the oven to 350 degrees. 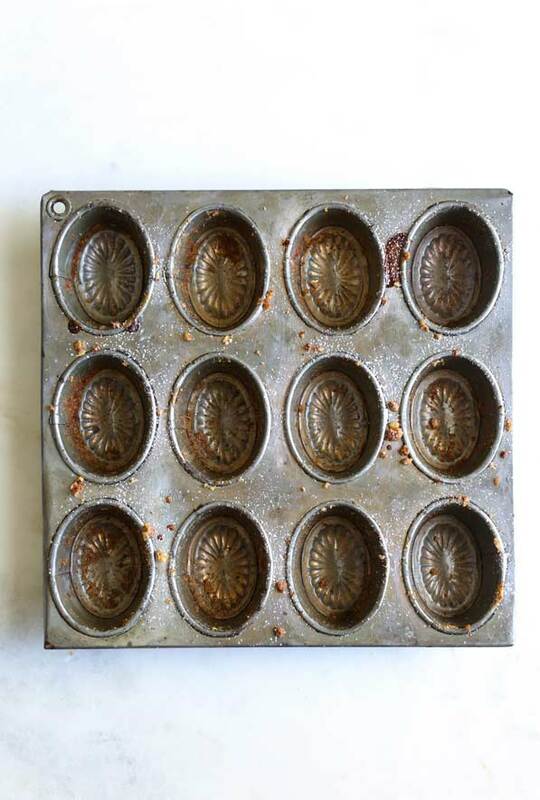 Generously oil and flour 12 financier molds or muffin cups. Distribute the batter evenly and top with streusel. To fry the sage heat the butter over medium heat until it begins to brown drop sage leaves in 3-4 at a time and fry until crisp. Remove to paper towel. Slice the figs into rounds or long slices. Whatever looks pretty and fits your cups. Top each financier with a fried sage leaf and sliced figs and/or peaches.